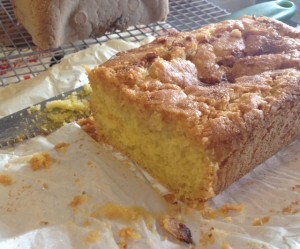 I recently went to a local women’s circle where one of the ladies had brought along a delicious gluten free lemon drizzle cake. Unfortunately when I went to recreate it I was out of lemons, but did have two sorry looking limes lurking in the fruit bowl. The result was incredibly tasty, and devoured by everyone within a day! You could make this with normal self raising flour instead of the gluten free flour, and I imagine oranges would be just as tasty as lemons or limes – just use whatever citrus fruit you have to hand. Mix together the lime juice and 1 tablespoon of sugar and drizzle over the cake. This cake is lovely on its own, alongside a cup of tea or coffee. I also found that it goes down very well with toddlers when served with custard for “pudding”!